Moby Grape was one of the greatest bands of the 1960s. Theirs is also one of the most mythical tales of the time. Band has successful debut . Things start to trail off with its follow up. Band leader goes crazy. The end. 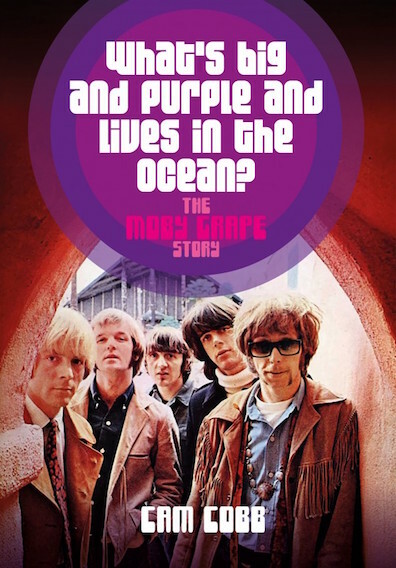 Of course, the Moby Grape story is more complicated that this simple layperson's mythology suggests. Cam Cobb attempts to set the record straight with What's Big and Purple and Lives in the Ocean?. Somewhat curiously, Cobb starts his tale in 1971, with the reformation of Moby Grape. He introduces the band through its reunion album, after Skip Spence, only one of the band's five "leaders," returned from his psychiatric commitment in Bellevue Hospital. After the band's stellar debut led into three subsequent albums of decreasing returns. After the band had ostensibly fallen off the face of the earth. It's an unconventional beginning for a biography, and the degree to which it works might be proportional to the degree of background the reader has on Moby Grape. The layperson mentioned earlier would likely find him or herself somewhat behind the eight ball. It's 84 pages in, with Part Two, that Cobb begins Moby Grape's story. He chronicles the band's formation, Columbia Records' wildly outrageous marketing campaign for its 1967 debut, which may be the first true illustration of "hype" in the music industry, the imitation Moby Grapes that the band's former manager promoted just at the time the real Grape should have been gaining traction, and the band's subsequent fall into obscurity. Kevin Parker—to the extent where very few other people are even involved in the recording process anymore—so it goes that new creations from Arctic Monkeys feel more and more like a collection of songs that are Turner’s, and Turner’s only.